SECRETARY KERRY: Good afternoon, everybody, I guess almost good evening. Federica, benvenuta a Washington. We’re happy to have you here. I’m very delighted to welcome Foreign Minister Mogherini to Washington. We met in Rome about two months ago, I think it was, and in the best Italian-American tradition, we bonded over food as well as good discussions. At the time, we were co-hosting an event that I might mention here which we consider important, which is support for the USA Pavilion at the Milan Expo 2015, which is focused on the challenge of feeding the planet, of food security and energy for life. And we believe it’s important to participate in this. We look forward to it. And I think when we consider the huge numbers of young people growing the populations of countries throughout the world, but particularly in Africa, South Central Asia, and elsewhere, the challenge of food security is critical, and we’re very grateful to Italy for hosting this affair and for highlighting the importance of this challenge. I think everybody here knows, and if they don’t, I will restate it clearly – Italy is one of the United States’ most important allies. We, I think, can safely say that our alliance has never been stronger than it is at this moment. And today, we spoke about some of the most difficult challenges that we face at this moment of time – from Ukraine to Syria to Libya, and always the challenge of Iran and the nuclear program, and the potential of peace – still a concern for peace in the Middle East. May 25th, we believe, we are convinced, is a real opportunity for the people of Ukraine to express their will through the ballot box. And Ukraine’s future absolutely should not be determined at the barrel of a gun. We all stand together, united for the independence and sovereignty of Ukraine, and we don’t believe that ballots that are marked in Moscow or referenda directed from there should decide Ukraine’s future. We deplore today’s violence and senseless killings, and the separatists who are very busy spreading fear and violence in Donetsk and Luhansk really need to answer the real call of the people of Ukraine, which is under the banner of “Let us vote.” And that vote, the real vote, will take place in the election on May 25th. The other key step in the path to heal the tensions politically are the Ukrainian-led, OSCE-supported national dialogue and the roundtables that are to take place across Ukraine. These will focus on decentralization and constitutional reform. And the United States very strongly supports this process. We’re in constant touch with the OSCE itself, with Foreign Minister Steinmeier and others, and with Foreign Minister Lavrov of Russia, in efforts to try to encourage this process to take hold as fully as possible, as fast as possible. And we also welcome the OSCE’s appointment of a veteran diplomat, Walter Ischinger, Ambassador Ischinger, in order to serve as a mediator in that process. So let me be clear: We expect to see, want to see, and will work to achieve real de-escalation, disarmament, evacuation of occupied buildings in exchange for amnesty and dialogue. And that is what is called for in the Geneva statement of the 17th last month, and also the OSCE roadmap. We hope that the OSCE will support the Government of Ukraine in facilitating these steps as rapidly as possible. Finally, I want to welcome the news that our friends in the European Union have applied additional sanctions on Russia – Russians, Russian individuals and Russian companies involved in the occupation of Crimea. The EU has made it clear that should the May 25th elections be disrupted in Ukraine, then there will be additional sanctions. So Russia, we would say – and we don’t say this punitively, but Russia really does face a choice, and the choice is to allow the people of Ukraine to determine their own future without interference from outside and with efforts by all of us to try to assist in de-escalating the tension, removing people from buildings, pulling back security forces, counterterrorism initiatives – all of those things – in order to give the people of Ukraine the ability to breathe through the democratic process. We also want to be clear: There are still threats to a Europe whole, free and at peace. And because of that, our commitment to Article 5 of the NATO Charter remains ironclad. NATO territory is inviolable, and we will defend every piece of it. That’s why we are deploying United States military assets to the region and that’s why the United States is encouraging our allies both to contribute to the reassurance effort that is currently underway as well as to meet their NATO commitments with respect to defense spending and planning. The foreign minister and I also discussed briefly the efforts to eliminate serious chemical weapons. We greatly appreciate Italy’s assistance in eliminating the Syrian chemical weapons, including offering the port of Gioia Tauro for loading the materials onto the vessel Cape Bay – Cape Ray. And I want to emphasize this really underscores Italy’s very strong commitment to this initiative, to help us destroy these weapons in the most secure and safe environment possible. I might underscore, we are currently slightly over 92 percent – 92 percent – of all of the chemical weapons of Syria declared being removed. There are still challenges with respect to some knowledge about undeclared, but at the moment we need to insist that the Syrian regime fully comply with its obligations under the Chemical Weapons Convention and the UN Security Council Resolution 2118. And we will remain vigilant until this is achieved. The last issue we discussed was the issue of Libya. I again thank Italy for hosting the donor conference in March, the ministerial conference that we held on Libya. The United States and Italy are very committed to the transitional process that needs to take hold even more in Libya, and we will continue to support the Libyan Government as it works overtime to be able to provide a democratic process and to deliver both good governance and security to the people of Libya. So, Federica, thank you for taking time to be with us today. I know you have to fly back to join all of us at the meeting in London, and then fly back again, so we appreciate enormously your efforts to be here today. And more especially, we appreciate the good work we’re doing together. Thank you. FOREIGN MINISTER MOGHERINI: Thank you, John. Thank you for welcoming me here in my first official visit abroad – and that was not by chance. That was a clear sign of showing how strong our – how good, how excellent our relation is, both bilaterally and in the international organizations we are in together. Actually, you visited Rome, I think, twice in the last couple of months. We were extremely happy to have you in the conference on Libya in the beginning of March, as we were extremely happy to host you during the visit of President Obama last month in Rome. I felt it was the most natural thing to do to pay my first visit in Washington to show how strong and excellent our work together is in all fields. Let me start by saying that I have been flying here directly from Brussels, where yesterday we had the foreign council on – whose main concern was Ukraine; how important it is that we speak with one voice, and we act in the same way. I want to thank you because I have experienced in this first month of my mandate good – extremely good coordination whenever it comes to facing a difficult situation. I think that part of the important response that we’ve given to the crisis in Ukraine has been in – speaking with one voice, both in Europe, across the Atlantic, in the G7, in the UN. And I think that has to stay our first priority, to speak with one voice when it comes to dealing with the crisis in Ukraine. At the council yesterday in Brussels, we decided exactly on the same line as you described – a mix of instruments for making sure that a solution to the crisis is found in the most effective and quick way. First priority is to stop the violence on the ground, to de-escalate, as was stated in the Geneva agreement of the 17th, and as we should make sure that it is implemented on the ground. We all agree and we’ve always all agreed on the fact that there is no military solution to the crisis that is extremely concerning for all of us. And the political answer to this crisis is a mix of creating the conditions for internal and external dialogue, the national dialogue that is going to start tomorrow, and that the leadership of the Ukrainian Government with the full support of the U.S.A., with the full support of the European Union, and following your words also on the United States and the international community, and on the other side, sanctions that always say it’s a way putting political pressure to get the result, which is a political solution to the crisis. But now the first objective for us is decreasing tensions, stopping the violence, making the elections of the 25th happen, and making them a success, and at the same time, supporting the Ukrainian Government to follow up the process of additional reforms in the inclusive way in which they have committed to do. As you said, we discussed also all the other crises that are open around us. Ukraine is extremely important, especially for us Europeans, but I know also for you how deep the concern is. Still, it should not shadow other crises that are extremely dramatic around us. Starting from Syria, three years of war, the need for re-launching a way of finding a political stop to the conflict, finding ways of giving humanitarian assistance, because there are people dying, children dying, and fleeing from the country. The surrounding countries that are by miracle sustaining this conflict – I think of Lebanon – and the process of dismantling the chemical arsenal that we are – happy is not the appropriate word, I guess, to describe that, but probably proud to contribute to by offering the Port of Gioia Tauro for the – for this operation. And again, it’s extremely important that at least this path is at least partially a successful one. As you said, we discussed Libya, shared the concern for a situation that in terms of security on the ground, in terms of control of the territory and of the borders of the country, is extremely worrying and unstable. The way is trying to support the internal democratic dynamics, political dynamics in the country, so that they manage to get to forming a government able to deal with the control of the country and of the territory itself. For us, it’s a priority, and I know that we have you and all the international community at our side in trying to find the most useful way on that. Thank you again for your commitment to Expo. We appreciate it very much, and we are willing to host you next year, but for sure before that in Milan for Expo 2015. It’s a great occasion for us to underline how much we can do together to fight one of the most dramatic elements of our time. On one side over-nutrition; on the other side, people dying, for hunger. There’s a contradiction there that we have to face and try to solve, and Expo is going to be a great chance for the international community to face this problem together and try to solve it and to move it forward. SECRETARY KERRY: Thank you. Thank you very much, Federica. We appreciate it very, very much. And let me – we are honored that you selected to come here first. We really appreciate that. And it is a sign of the special relationship and the way we work together, so I’m very grateful. We all are. FOREIGN MINISTER MOGHERINI: Thank you, but it’s natural. That’s natural. MS. PSAKI: The next question will be from Paolo Valentino. QUESTION: Thank you. I have only one question for each of you. Mr. Secretary, I’m afraid my question will be a bit out of context, but the subject has been vividly discussed in the last 24 hours in Italy and in Europe. In his recently released book, former Treasury Secretary Tim Geithner claims that in 2011, some European officials approached him asking for help in a scheme to force Silvio Berlusconi out of power, and that the answer was no. Now, despite the fact – I quote – “that it would have been desirable to have better leadership in Europe,” as a member of the cabinet, do you have anything to say on behalf of the Administration? And as then-chairman of the Senate Foreign Relations Committee, do you have any recollection of having any hint or echo of this subject at the time? For Minister Mogherini, Ukraine: Today, you sounded a note of cautious optimism about the possibility of launching a national dialogue based on the apparent acceptance from both Kyiv and Moscow of the OSCE roadmap. Now, how does this square with the growing violence which, even today, claimed some victims? And did you, in your talks, discuss the eventual possibility of floating the idea of a UN-sponsored interposition force in Ukraine? Thank you. FOREIGN MINISTER MOGHERINI: I got the easier question. No, we didn’t discuss that option. It is not on the ground so far. As concerns the first part of the question, it is exactly because violence on the ground is not diminishing that we need to support a national dialogue effort. Tomorrow, as far as I know, the first national dialogue exercise will start in Ukraine. Obviously, it is an extremely difficult process. It is not easy. It is not to be given for granted that it works. But still, we are putting all of our political pressure on all sides, including, obviously, Russia, to be coherent – words and actions – and allow, first, violence on the ground to stop, and second, Ukrainians to talk to each other and to find their way of ruling the country as one country. We have said from the beginning territorial integrity, unity, sovereignty of Ukraine is our goal. For doing that, for achieving that, we need internal dialogue and the dialogue with all the regional actors relevant. 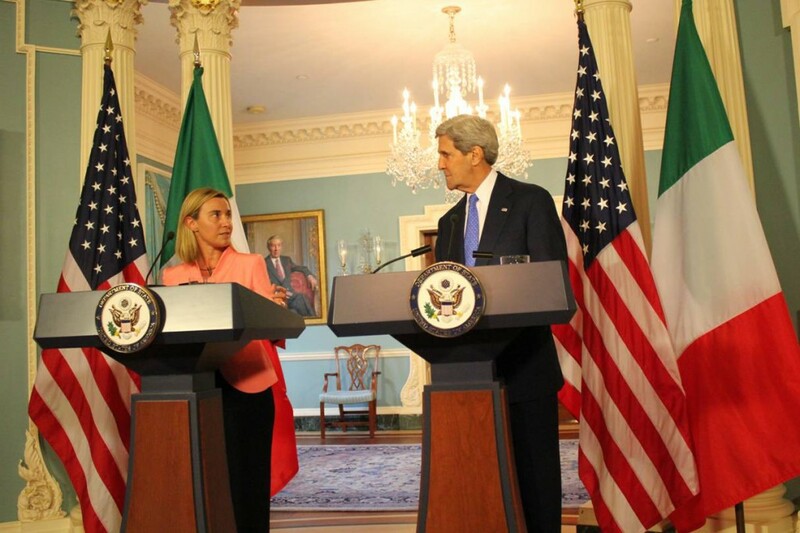 SECRETARY KERRY: Io non so niente. FOREIGN MINISTER MOGHERINI: I said the same. I said the same. I said the same. Exactly the same. QUESTION: Did you read the book? SECRETARY KERRY: No. No, I was not – I – absolutely, this is the first I’ve ever heard of it. Thank you. Grazie tanto. SECRETARY KERRY: Honestly, I hadn’t – I knew nothing as Chairman of the Foreign Relations Committee, and I know nothing about it now. You have to ask somebody else. FOREIGN MINISTER MOGHERINI: — in those remarks? Sorry, it’s a little bit of jetlag coming in. One is the dimension that we discussed and I wanted to say publicly how much we appreciate the efforts that John has been putting and is still putting on the Middle East peace talks that are now facing a difficult time, but his efforts and his commitment to that are precious. There are all – not only us Italians, but all Europeans supporting this effort very much, and hope and think that this work is an excellent opportunity for the Middle East to finally find a way out of the conflict. And second, we also discussed Afghanistan and to recommit ourselves, once the election phase is over and there’s a new leadership in Afghanistan, to accompany their democratic transition furthermore. MS. PSAKI: Thank you everyone. SECRETARY KERRY: Is that it? Thank you very much, everybody. Thank you.